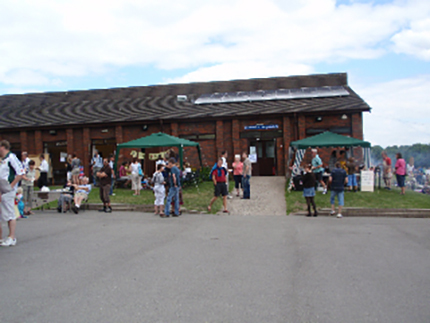 When the Association was founded in 1964 one of the first objectives was to build a local Community Hall for use by the Association and its members. After ten years of enthusiastic fundraising, Hallam Community Hall was opened for business in 1974, built in the grounds of Hallam School, Hallam Grange Crescent on land leased from the Local Education Authority. It very soon became obvious that the original Hall was not big enough, and in 1978 an extension was added. In 1987 the original pre-fabricated building with a flat roof was converted into a fully brick-built building with a pitched and tiled roof. In 1997 an annex to the Hall was opened, providing much needed changing rooms complete with showering facilities, and a good sized meeting/training room. All these works were paid for using funds raised by the Association, with a little help from Sheffield City Council. The later additions were aided enormously by grants awarded by the National Lottery, and various other charitable organisations. The Hall is in use almost every day of the week, morning, afternoon and evening, with the various section activities, and is widely hired for Wedding, Anniversary, and Birthday Celebrations. It is suitable for both large and small functions (can seat up to 200 people), it has a fully sprung dance floor, full bar facilities, ample car parking, and we can arrange your disco to be presented from our own disco booth. The well-equipped kitchen is popular with local caterers, who recommend the Hallam Community Hall to their clients. The original objectives, written in 1964, were “To preserve space for recreation and to provide cultural and social activities for the residents of Fulwood and Lodge Moor”. These few words succinctly capture what the Association is all about. We are proud to have achieved so much in such a little time, and we continue to seek new ways of encouraging a good family, social and community atmosphere in our small part of the universe. If one of our members suggests a new activity, we encourage it, support it, nurture it and watch over it until the new section is able to be self-supporting. We are totally non-sectarian, non-political, and non-profit making. 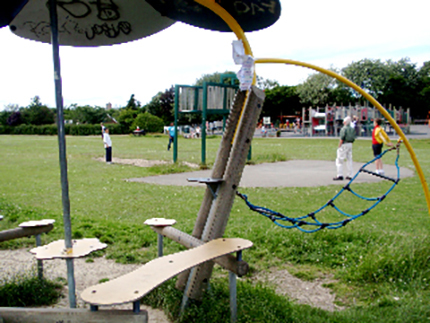 The first Children’s Playground was erected by Sheffield City Council in the mid-1960’s, and consisted of swings, a roundabout, a slide, a rocking horse and a climbing frame. Because the climbing frame was in the form of a large spider, the local children quickly started to refer to the Playground as Spider Park. The name stuck. Over the years the equipment wore out, and, because of financial constraints, was removed but not replaced. It was a day for great sadness when the old spider was finally cut down, leaving only the swings and the slide. 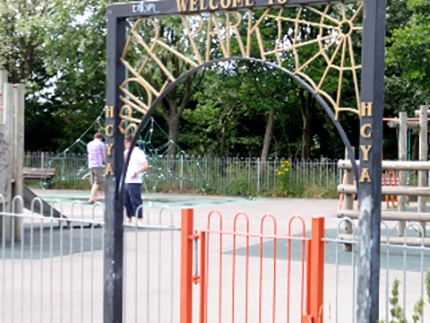 In 1999 The Hallam Community and Youth Association decided to try and refurbish Spider Park as its Millennium Project. An appeal was made for funding, and in 2001 the Community Fund (National Lottery Charities Board) awarded a grant of £137,000 to the Association to allow the project to proceed. The park was formally opened on 23rd March, 2002 by the Chairman of the Association, Mr. Alan Bone, in front of a massive crowd of over 500 local residents. Balloons and Badges with the Spider Park motif were given to all children in attendance. Although the playground itself was funded by the grant from the Community Fund, Hallam Community and Youth Association commissioned and paid for a wrought iron archway to welcome everyone to the playground. They also produced a small plaque to be displayed on the site, giving the history of Spider Park. The new playground has been designed to cater for all ages. Within a fenced off area, safe from dogs and other animals, a wonderful range of equipment suitable for toddlers and juniors has been provided, including a large spider’s web climbing net erected over a picture of Webster, our playground’s guardian spider. Outside of the fencing, there are football goals, a basketball apron with shooting net, and a teenage meeting area with modern seating accommodation. The Association has leased the area of land from Sheffield City Council for a term of 15 years and will act as caretakers of the site. They hope to make other improvements, plant flowers etc, from time to time. Sheffield City Council will provide maintenance and insurance services. Anyone with comments (good or bad) about the Park, or wishing to know more about it, and the Association’s plans for further improvements, is invited to contact any member of our Committee. We are keen to meet needs that are identified by people who use the park. The Committee has discussed concerns about road safety at both entrances to the park. An early need was for additional seating, and we now have the money, through fundraising and donations, for a picnic bench (or two). We are very grateful for two new seats that have been donated – one, a memorial bench in the playground, and a bench at the top of the field donated by the South West Area Panel. Finally, there are a number of local dog walkers and others who regularly clean litter from Spider Park and the field, and generally keep an eye on it, and we thank them most warmly for helping to maintain a safe and pleasant environment for everyone to use.